Thieves in Newport smashed an ambulance window and stole the sat nav screen while paramedics were treating a heart attack patient. The thieves struck after the crew answered a 999 call in Broadmead Park, Liswerry, at 2300 BST Wednesday. The damage meant the £115,000 ambulance could not be driven and there was a delay getting the casualty to hospital. Mike Finiak, from Newport Ambulance Station said the "despicable act" could have had life-threatening consequences. The crew had left the ambulance locked and parked near a street light, and were away from the vehicle for about 15 minutes. 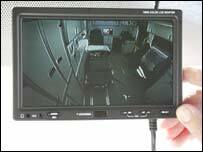 Among items stolen was a screen used for transmitting call and location information to the ambulance, a sat nav remote control and personal items belonging to a crew member. A replacement ambulance had to be sent to the address to take the patient to hospital. Mr Finiak said: "We then had to find a replacement vehicle for the crew for the rest of the night and for today." He said the police were examining the vehicle, and repairs would have to be carried out before it was roadworthy. "It's not as if the sat nav can be used in any other vehicle. It's useless to them," he said. "This is a despicable act and one that could have caused life-threatening consequences - we've gone to a cardiac arrest and have been delayed in taking the patient to hospital."